Europe’s most highly diversified gas importer has vast untapped import capacity which it could use to route gas into France and beyond. But underdeveloped pipeline links with other countries have effectively made Spain a gas island. “Spain has one of the safest and most diversified gas systems in Europe. We want to offer our capacity to the rest of the continent,” Antoni Peris, chairman of the Sedigas gas association told journalists at a briefing on Thursday. The EU relies on Russia for about a third of its oil and gas, and tensions with Moscow after its intervention in Ukraine’s political crisis have heightened concerns among its 28 members about the security of their energy supplies. Some 40% of that gas is shipped through Ukraine. Spain, meanwhile, does not receive any of its natural gas from Russia and was entirely shielded from the EU gas crises of 2006 and 2009 when rows over unpaid bills between Kyiv and Moscow led to the disruption of gas exports to western Europe. Strategically positioned on the Mediterranean, about half of its gas comes from Algeria and the remainder from ten different countries around the world, mainly in the form of liquefied natural gas (LNG) which is shipped on tankers. Spain spent billions of euros on its gas infrastructure during an economic boom. With seven LNG regasification plants, it has more capacity to turn liquefied natural gas back into gas than any other European country. Now it is lobbying the EU to forge ahead with plans for a new pipeline, called MIDCAT, to transport gas into Europe. MIDCAT, which is currently on the European Commission’s list of strategically important projects, would put Spain’s interconnection capacity with France at 14 billion cubic metres a year (bcm/y). The 190-km pipeline is planned to run along the Mediterranean coast. “With this pipeline Spain could replace 10% of what Europe currently receives from Russia,” Peris of Sedigas said. 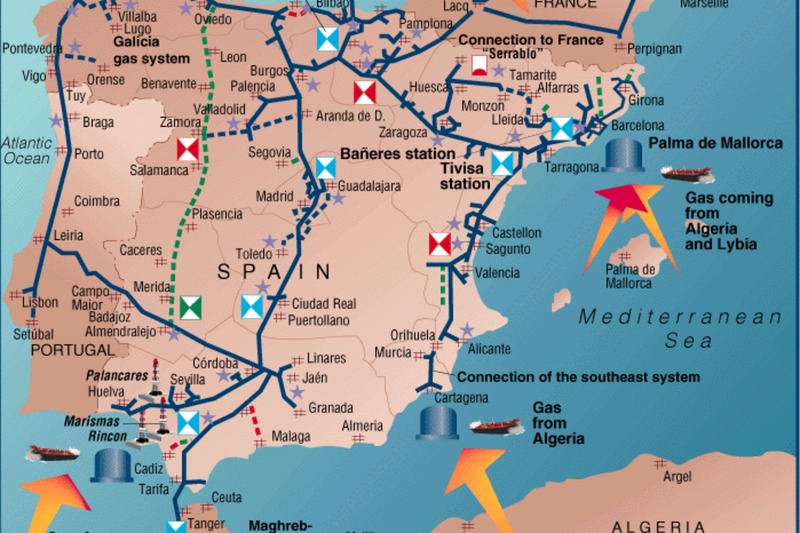 Right now there is only one gas pipeline between Spain and France, called Larrau, which can transport 5.2 billion cubic metres (bcm/y), a fraction of the 462 bcm of gas consumed by the EU last year. A new pipeline called Biriatou, running from Spain’s Basque Country into France, could add another 2 bcm/y of interconnection capacity when it is completed in 2015, Peris said. In response to previous Ukraine gas crises, Europe made some progress in improving cross-border energy networks, boosting storage capacity, and making pipeline flows reversible, putting it in a better position to cope with any disruption of Russian exports than in the past. Following recent tensions in Ukraine, the EU has asked the United States to start exporting its natural gas. But US President Barack Obama on Wednesday linked any export deal to a new transatlantic trade agreement, and said the EU cannot rely solely on the US to cut its dependency on Russian energy. The Ukraine crisis has also stirred a debate over other energy sources in the EU, with some advocating stronger targets to use more renewable energy, and others pushing for nuclear, coal or shale gas, which could also help the EU to become more energy independent. The 20-21 March EU summit tasked the European Commission to come up with a plan for decreasing the Union’s energy dependence from Russia., in the wake of the Crimea crisis. At the summit, Council President Herman Van Rompuy also spoke of the need for more national and regional gas interconnectors to be built, specifying that those should include the Iberian peninsula and the Mediterranean area. He also spoke of the need of solidarity in case of energy disruptions, and developing interconnectors with third countries, where relevant [more].